Mmmmmm. 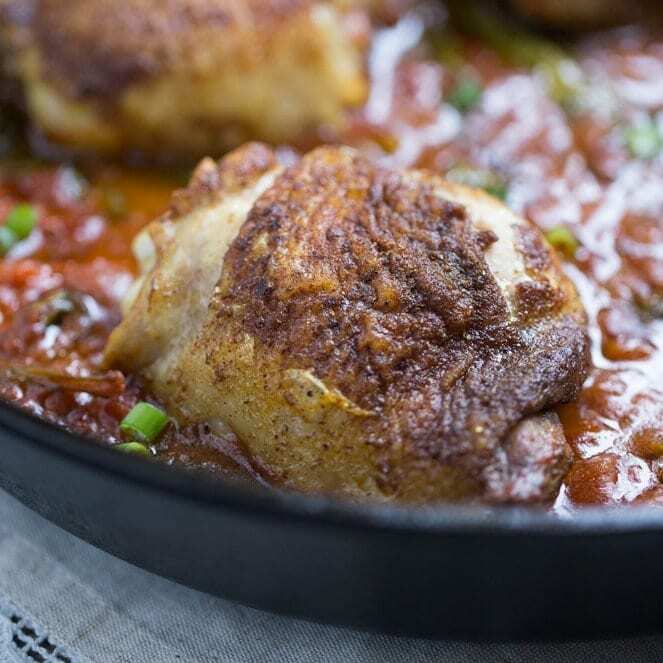 Today we are talking about all of the goodness that’s CHICKEN THIGHS! 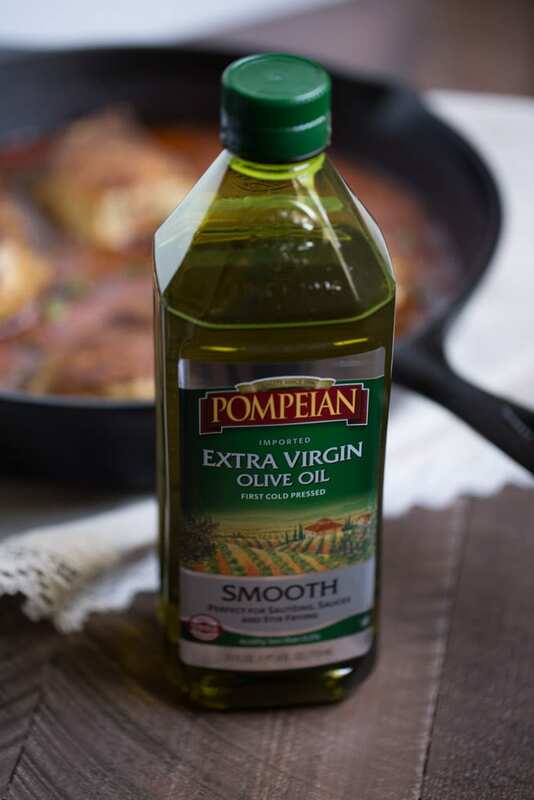 Can we just take a minute to talk about how AWESOME Pompeian products are? The Smooth Extra Virgin Olive Oil is SPOT ON! it’s a healthy fat cooking option. it’s great for sautéing, stir frying and making sauces. QUALITY, folks. This olive oil carries the USDA Quality Monitored Seal. it’s subtle flavor doesn’t overpower my food. Stir together the curry powder and kosher salt. Sprinkle the top and bottom of the chicken thighs with 1 tbsp of the mixture. Reserve the remaining curry powder/kosher salt mixture. Heat the olive oil in a large oven-safe skillet over medium high heat (I used a 12 inch cast iron skillet). Swirl the oil in the skillet to coat it. Add the chicken thighs and cook 3-5 minutes per side or until nicely browned. Remove the chicken thighs and set aside. 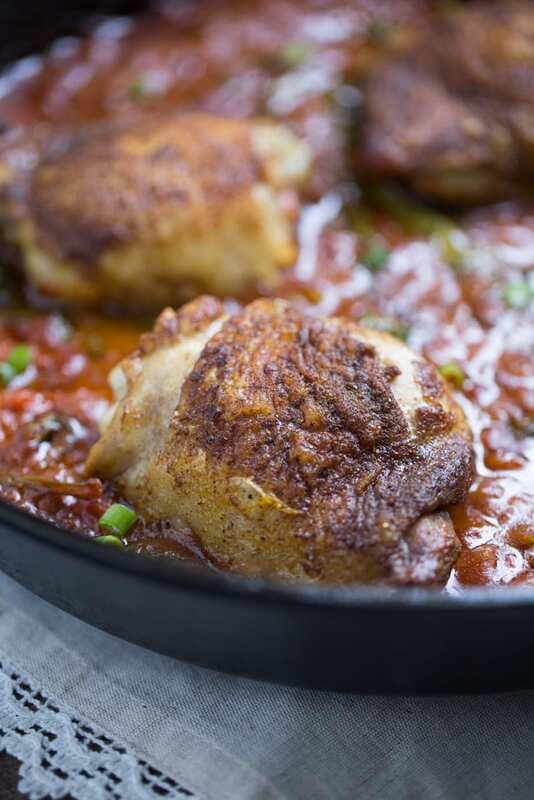 Return the chicken thighs to the skillet and turn off the heat. 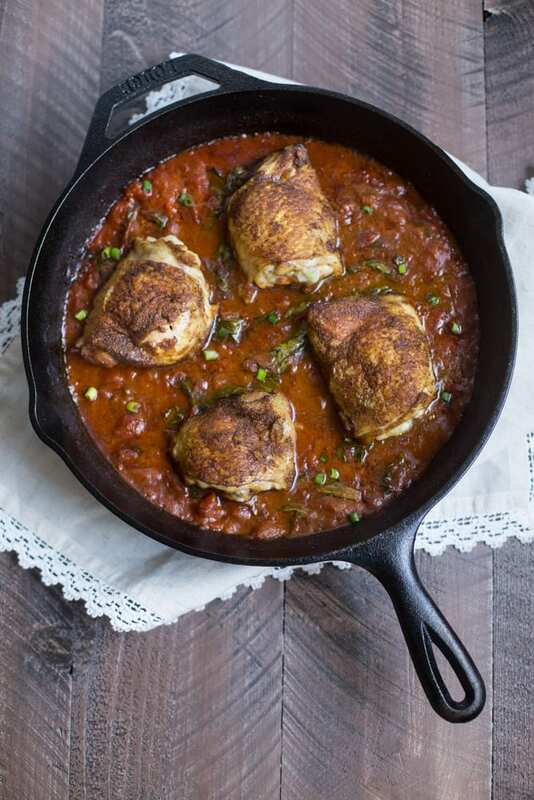 Place the skillet in the oven and bake for 25-30 minutes or until the thighs reach an internal temperature of 165 degrees. My chicken thighs reached 165 after 30 minutes of baking. Serve the chicken thighs and sauce over cauliflower rice or your favorite whole grain, such as brown rice or quinoa. Garnish with green onions, if desired. Nutrition information is approximate and was calculated using My Fitness Pal. Nutrition information is for 1 chicken thigh and approximately ¾ C of sauce. Using cauliflower rice or your choice of grain will alter nutrition content. This looks amazing, I love how versatile my iron skillet is! I just got a cast iron skillet and have been using it all the time! Chicken thighs are my fave part. Your recipe looks fantastic! What a gorgeous looking dish, and I love the crispy skin! Oh this looks so good! Coconut curry is one of my favorite things ever. Can’t wait to try! 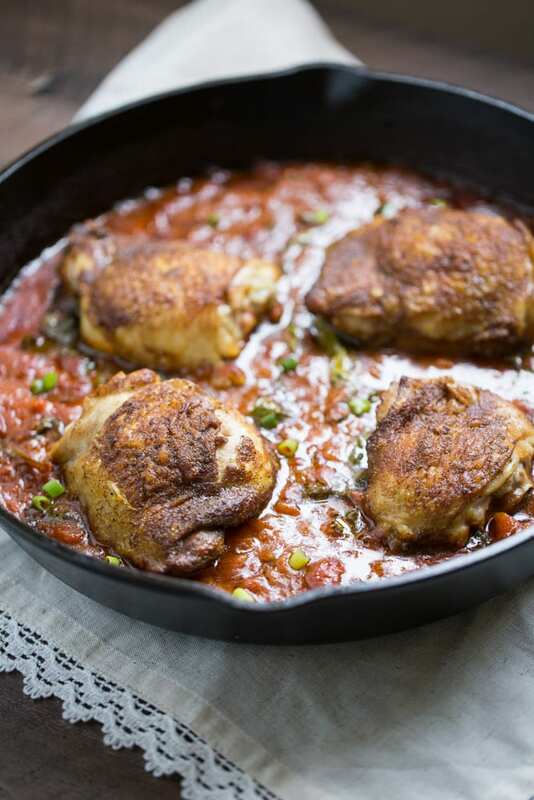 I need to use my cast iron skillet more – this looks like a great dinner for us Julie! Coconut Curry ALL the things! Love these flavors!! This looks fantastic. I love curries so this is up my alley. Can anyone recommend a replacement for tomatoes for this? I don’t eat them, but the rest of this dish is exactly what I’m looking for! Hello, you could try puréed squash or pumpkin in place of the tomatoes.